Spirit Mars rover has rolled into position for a grand view atop Husband Hill. 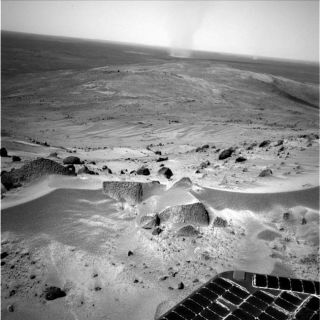 Note dust devils scooting by across the Gusev crater landscape. A dust devil is much like a tornado on Earth. The Spirit Mars robot is closing in on a milestone moment in its roving history - wheeling up into position atop Husband Hill. Images being transmitted by Spirit show a breathtaking view from its vantage point. "We are within sight of the summit," said Larry Crumpler, a member of the Mars rover science team. He is also research curator in volcanology and space sciences at the New Mexico Museum of Natural History and Science in Albuquerque. "We can see 'Home Plate' now as well. The view is really opening up," Crumpler told SPACE.com. Mars rover science teams are prepared to do a "full summit campaign" of observations, he said. Crumpler said in an earlier interview, once at the summit, one of the goals there will be to take a hard look at the basin to the south where one of the long term targets of interest -- Home Plate -- is located. Many on the rover science team are hungry to get a look at the possibly layered terrain on the east side of the basin on the way to Home Plate - about a kilometer from Spirit's current location, and a trek that might take a few months, Crumpler noted. NASA also released an animation of dust devils scooting across the Martian surface. Spirit and its twin, Opportunity, reached Mars in January 2004 and are well beyond their initial mission timeline. All of the hypotheses about the origin of Husband Hill are still quite alive and well, Des Marais noted. They include: 1) a volcanic mount; 2) ancient layered crater floor deposits; 3) remnant of an uplifted crater rim with a mixture of materials having various origins. "We will probably examine both the sandy deposits and rocks in the summit area," Des Marais said. "Perhaps our greatest opportunity to understand how Husband Hill formed will come when we examine the rocky units that orbital images indicate might adorn the southern flanks of the hill."